RUSH: By the way, I meant to announce this at the top of the program, but, you know, I never make things about me. We have a brand new app. We’ve revised the app, the RushLimbaugh.com app for your iPhone, your iPad. Now, I’m a little… I don’t know if our Android version of this is ready to go. I think it is. But I know the iOS version of this is ready to go. We have redesigned the app and we have made it a coordinated appearance and look with the RushLimbaugh.com website. It’s for members and nonmembers. Even if you’re not a member of the website, the app still offers plenty of access to much of what happens here on the EIB Network. If you are a member, then you can watch the Dittocam on demand on the Rush Limbaugh app on your phone or your iPad. You can watch past versions of the program on the Dittocam. You can listen live via audio streaming or you can listen to previous programs if you wish. You can sign up for the podcast delivery of the program each and every day. Full-fledged content. What? (interruption) “Do we give that preferential…?” (interruption) Well, I would never say that, but we are able to recognize it. But it’s… A lot of people have worked on this. You know, Apple approved this app I think late last week, and we’ve been putting our final touches on it. And it actually launched this morning. Now, if you’re an existing member, the app ought to upgrade automatically for you. But if you haven’t yet — and the app is free. It has what’s called an in-app purchase, and that is if you want to become a subscriber to RushLimbaugh.com, you can do that from within the app as well. But, I mean, the benefits of immediacy in terms of being able to stream the program right through the app or watch Dittocam right through the app on your phone, on your device or what have you — and, of course, the total mobility that comes with it — is awesome. We are proud of it. As you know, I’m a huge tech guy, and I had a lot of demands on this in terms of a design and the ease of use. I wanted to make it intuitive. I didn’t want it to be a giant maze that you had to scroll and hunt and peck to find what you’re looking for. So we’ve tried to simplify it and make it, you know, much, much more… “Intuitive,” I think is the word for it. So you can get it at the iOS Apple Store, App Store, right on your phone. And I’m gonna have to double-check. I’ve gotten some confusing notes on the Android version. I was able to check the Android version, but I don’t not yet know if it’s actually deployed yet or if it’s coming. But I’ll find out for certain. 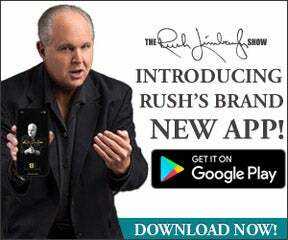 RUSH: Confirming the new upgraded RushLimbaugh.com app is live and ready to go on Android at the Google Play store. So upgraded today for both iOS and Android. And, folks, it’s great, it’s fabulous. It’s a much needed upgrade, and just looks awesome.